Our story begins in the summer of 2014. 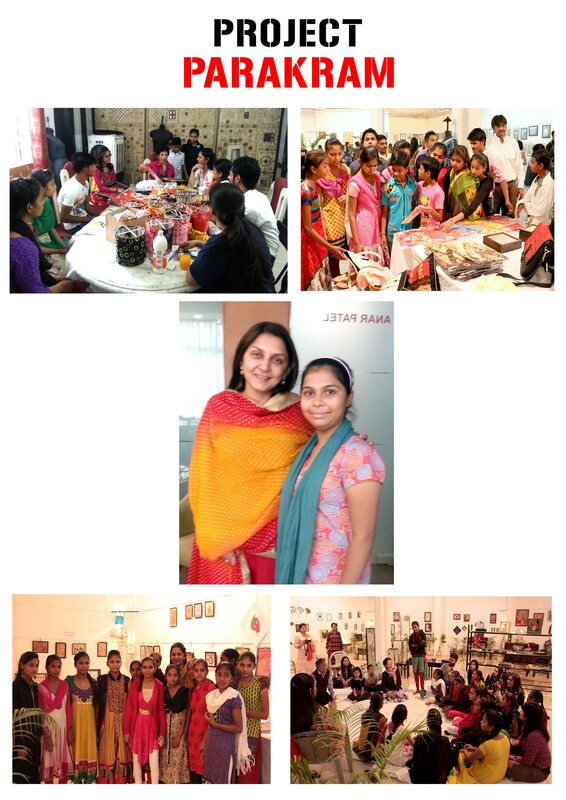 Ms Anurita Rathore, an eminent journalist, Art Enthusiast and the Proprietor of Eyescapades, an event Management Company, conducted the First Art Auction for Charity in July 2014. The aim here was that the proceeds of the auction would go towards a Creative Vocational Art Education for underprivileged urban children. Eminent artists and other notable members of Society came together to paint, sculpt and create for a cause! The event made ripples in the circles of Ahmedabad! And was a First-of-its-kind event hailed by everyone as a great Success! The Auction itself was conducted by YudhishtarUrs, in a wonderfully lighthearted way, which brought laughter and spirit to a great Art Auction! Once the Auction was over, the views of all the participants were taken in the gallery, to decide how the corpus,so generously donated by the artists,was to be used. After a series of meetings with the Board Governors at IDEAL, and with the trustees of FACE (Foundation for Art & Craft Expression), the Trust associated with IDEAL, the PARAKRAM Program, began. 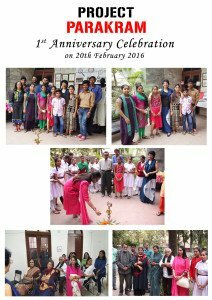 A two year, Creative, Vocational Program was designed by Asha Mandapa, Academic Director IDEAL to impart quality education to the children in the age group 13 years and above. The aim was to focus on Skill development with Creative and Vocational training that would enable the short-listed children to realize their goals of self-reliance and self-sufficiency. A key factor of this program was that the raw materials used by the children would be easily available and affordable to ensure sustainability in the long run. The next few months went in meeting with members of YUVA and Ms Anurita Rathore, in identifying candidates who would benefit the most, through, specially designed screening processes. This resulted in a group of 28 children being identified. This was done with the knowledge (and expectation) that some children would eventually and naturally drop out of the program, while those that remained would be the committed group that would be developed further. And so, we entered 2015. 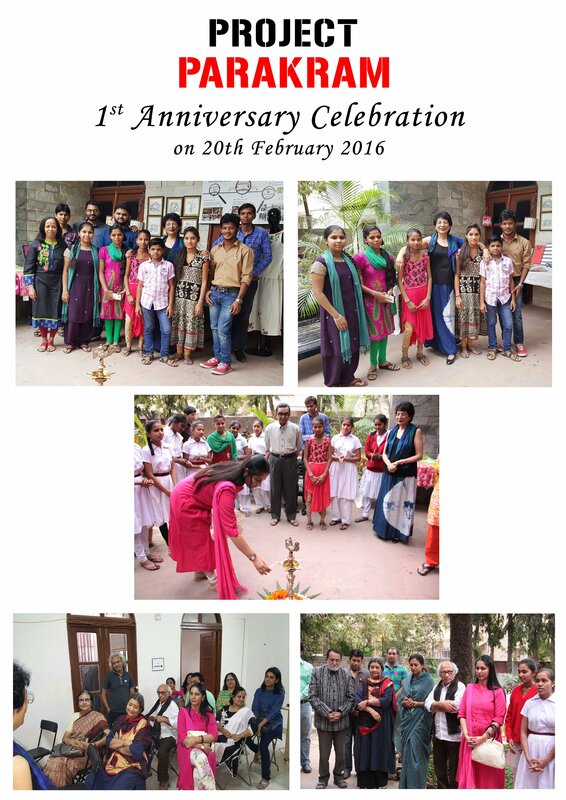 With everything finally in place, the inauguration of the PARAKRAM Project took place on 21st February 2015 with the children, the volunteers, the Various Artists who had donated so generously to the project, and even Trustees from FACE all in attendance. This was a wonderful new experience for everyone, and the event was supercharged with the spirit of good energy, hope and positivity. To commemorate the start of the program, the Senior Artists, Members of the Trust and Ms. Anurita Rathore presented the children with Basic Art Material Kits. The program had officially begun! The last days of February went in aclimatising the children to the new routine and incorporating the new program into their lives. Even the children’s parents/guardians visited IDEAL, and went away reassured that their wards were in good hands! February began with a basic Foundation program that carried into the month of March. The students of IDEAL, the IDEALists and the students of PARAKRAM began to interact and work together. A program of Sketching, Understanding form and line, simple perspective exercises, light and shade were taught. To relieve the monotony of these exercises, and to generate and maintain excitement through the learning process, fabric as a material was introduced. The results of doing this were truly wonderful. The magic of vivid colour and the fabric dyeing processes stimulated the children, and a short term goal was set for the children. The goal being, to participate in ‘PEHCHAAN – The Identity’, the annual exhibition at IDEAL, and that too in March 2015. This required a great deal of effort and planning, and it is here that the individual abilities of the children began to be seen, and engaged. We had the planners, the list makers, the follow-up leaders and the motivators!! And everyone worked as a unit. They had begun to realise, that they had to be competitive as well as creative! And creativity was not just limited to the designing of the product, but was needed in staying within budgets and in being realistic. As the weeks rolled by, the students learnt first-hand, the importance of presentation, respect for material and more importantly, how to reduce wastage and utilise even scraps. And with it all, the Foundation program and the Dyeing module, continued. Surely and steadily! Mistakes were made and addressed. Products were re-done. And finally they were ready! The Annual exhibition at IDEAL was held in March 2015, at the Ravishankar Rawal Kala Bhavan. Amidst all the hustle and bustle, the PARAKRAM children were involved in every aspect of the Exhibition. This included the arranging of their stations, the hanging of their pictures, learning how to talk to their guests and how to bill their clients. They were growing up and learning fast! And all of us at IDEAL, from the students to faculty to volunteers, were so proud! The first order was by Amitaji Dalal! The children were delighted! They were feeling the rush and momentum of a journey well begun. But more work was to follow. School Exams and vacations followed shortly…. Some students went home. Some continued through the summer and become woven into the pattern of our lives at IDEAL. Over the next few months, the children too went through many changes. For many, the Municipal schools changed and children were shifted. Some went to new schools with new timings. Some entered the Tenth standard and twelfth standard! Difficult times for all. With this, transport and co-ordination also became a problem. But we came through, and the children continued, lesser in numbers, irregular in attendance but still there. However, it is important to note here, that through the changes in schedules and the holiday periods in the program, many of the PARAKRAM children still chose to come to the institute on a daily basis to learn as much as they could. This was done on their free time and of their own free will without persuasion. And this was all the incentive we needed to know for sure that the program was working and we were getting through to them. Orders were coming in for a lot of the products from the exhibition. One of the highlights during this time was a workshop conducted in association with the AASMAN Foundation, on the IDEAL Campus. This involved the PARAKRAM children actually teaching the volunteers and the children of the AASMAN foundation. This was a dramatic turn of events that saw our young wards going from students…to being TEACHERS themselves! And this was so much more than we had ever expected at the start of the program. 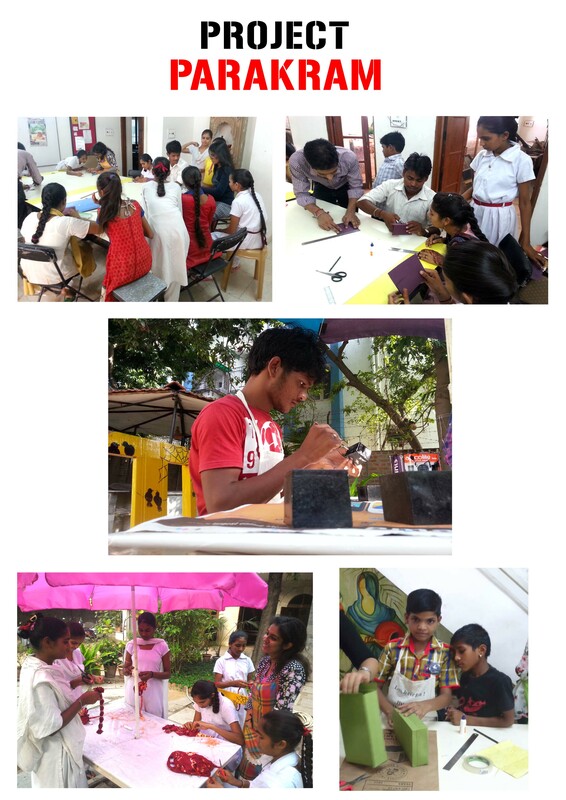 Students, worked through the Diwali Vacation on their own volition, to finish projects and meet deadlines. More than the work itself, it was the healthy attitude towards the work that we were trying to instil. We really appreciate all the patrons out there who had as much faith in this Project as we did. And we know you aren’t disappointed. December 2015 saw the next Exhibition at IDEAL, titled ‘PEHCHAAN – Perceptions,’ where the PARAKRAM Children had a larger platform to exhibit their work at the Ravishankar Rawal Kala Bhavan once more! And this time, they were exhibiting ALONG WITH students of CEPT University, PDPU and IDEAL. The PARAKRAM children stood the test and succeeded with flying colours. It was truly a memorable evening with the Artists discussing ideas and past projects with the children and great appreciation was shown for the children’s works in all the media. Some students have been introduced to the medium of glass, with the glass programmes at IDEAL. Others are exploring techniques in Fabrics & Apparels like knitting, sewing, cutting and single garment making. And the story goes on !